It's back to school this week and I'm trying to be organised around meal times. 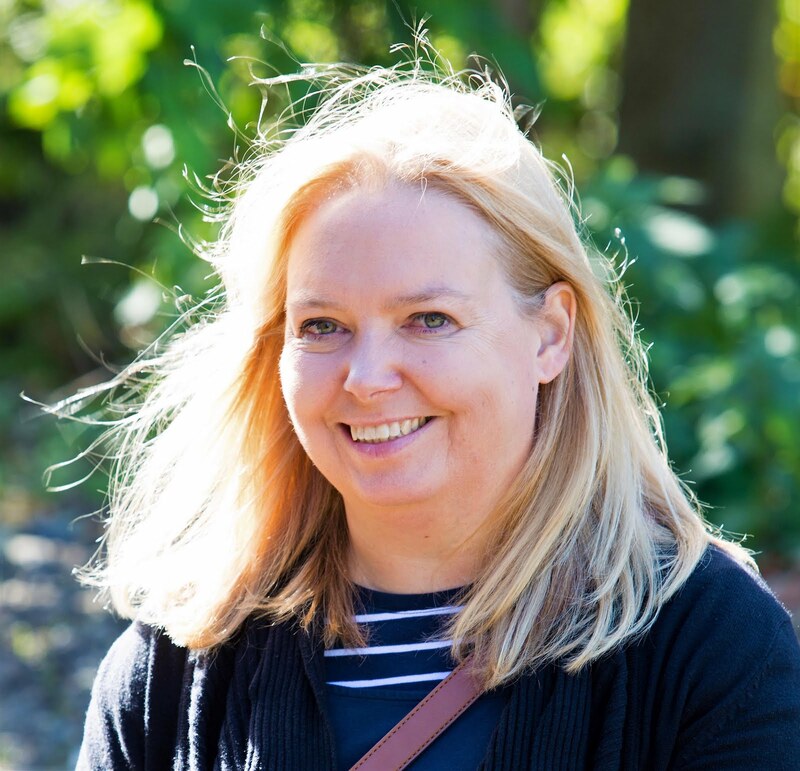 The boys have packed lunches which I plan, if not prepare, in advance, and I always have some sort of meal plan in my head when I go food shopping, but have nothing set out for the week. This is a very simple noodle dish based on the ‘pot noodle’. 3 nests of noodles (1 per adult, half a nest per child); frozen or tinned sweetcorn; frozen peas or any other vegetable, we sometimes use edamame beans, and half a bag of Quorn pieces, plus a stock cube. Or Soy Sauce and curry powder too. Cook the noodles in a pan of boiling water as per instructions. Cook the sweetcorn, peas and Quorn in a pan until soft. Drain and coat with flour (to help thicken the sauce). Add to the noodles as well as a stock cube, add water and stir until the desired consistency is achieved. Soy sauce is an optional extra. An alternative version is to use curry sauce powder to make the sauce instead of a stock cube. Using Quorn mince we regularly eat a mild Chilli con Carne as a family, accompanied by rice and garlic bread. As we head into Autumn we’ll be eating lots more soups. My boys always wanted tomato soup, so I created a tomato soup recipe that also had carrots, onion, peppers, and lentils in too, making it full of goodness. Eaten with freshly baked soda bread it's delicious. Chop all of the vegetables and garlic and gently saute in oil in in a pan. Add the stock cube and water. Bring to the boil and then simmer for 20 minutes. Blend carefully, I use a hand blender, and serve. Add seasoning to your taste. If using Buttermilk just add as it is. To make you own gently heat the milk and add lemon juice. Kneaded very gently to form a round. A favourite at any time of day we sometimes enjoy a full English or a grill using Linda McCartney Sausages, potato waffles, onion rings, grilled tomatoes, mushrooms and beans. You can also add an egg too. Heat over to 200 Degrees. Place waffles, hash browns, onion rings and sausages on baking trays and put in the oven for 20 mins. Chop the mushrooms and gently fry until soft. Heat the beans in a pan on the hob. A Friday night treat is making homemade pitta bread and topping our own individually for the perfect pizza. Toppings: You can choose whatever you like. The boys especially like to pick their own toppings. 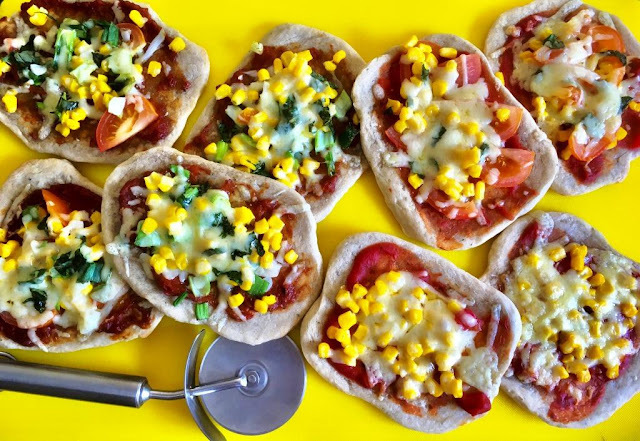 We had: Onion, Sweetcorn, Tomato, Cheese, Basil, Garlic, tomato sauce and homemade BBQ sauce. In a big bowl combine flour and salt. Mix in olive oil and water. Knead into a soft and sturdy dough - It should be smooth. Cover the bowl and allow to rest for 40 minutes at room temperature. Bake in the preheated oven at 200°C/400°F for approx. 15 minutes. All of these meals can be ready within an hour – many in far less time. 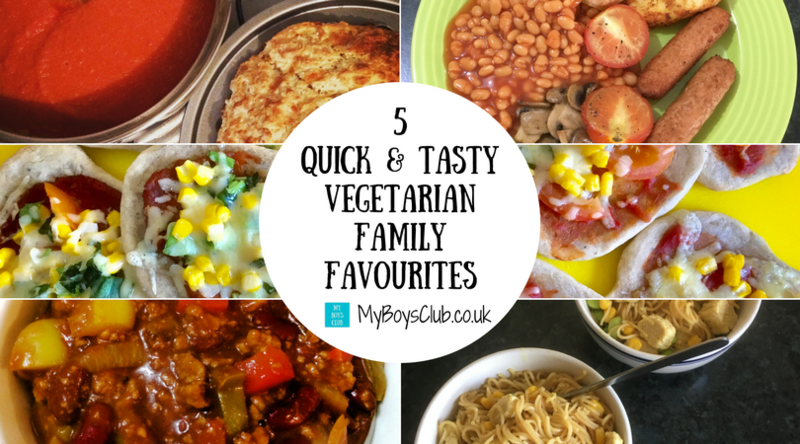 They are meals that the boys always love, and full of nutrition and tasty too. 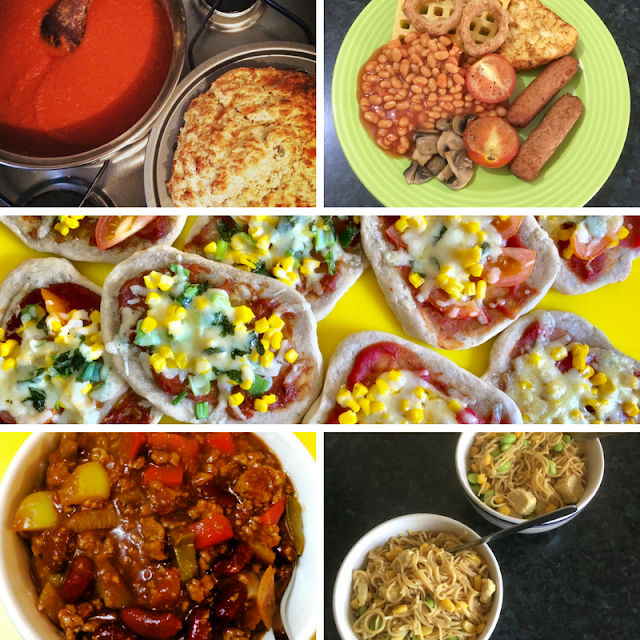 What is your favourite family meal for after school? Or why not pin these recipes on Pinterest? 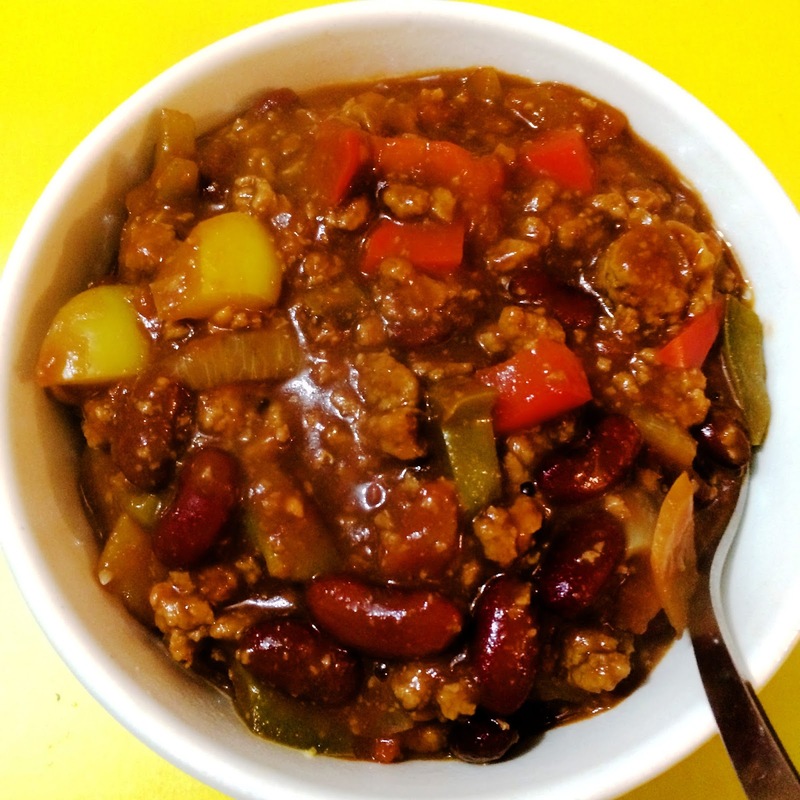 We quite often make a chilli with quorn mince - I don't think it tastes any different and it's so much better for you! Some great recipes here, I keep trying to have veggie weeks with my husband but I'm lacking inspiration so this is a definite help! I am all about quick tasty meals esp as we are a foodie family! 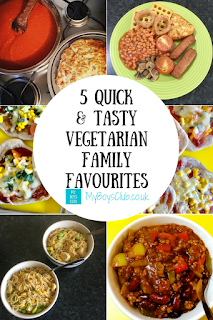 I'm raising my son as veggie but he's a little bit young for any of these... with an imminent return to work I might keep them in mind for when I don't want to make anything big for myself!